It's happened to all of us. You fire off an email to an online retailer's customer support address...and wait...and wait...sometimes for days before getting a response. Well, tech shoppers seeking faster feedback might try OfficeDepot.com, which has the fastest email reply time among the 100 largest Internet retailers in the U.S., according to a new study by StellaService, a research firm that rates the customer support of online businesses. When it comes to phone support, however, SierraTradingPost.com had the shortest average call hold time--only six seconds--among the Top 100 online retailers. At the opposite end, Barnes & Noble (BN.com) made callers wait at least 8 minutes. That's good news for fans of heated socks, but bad news for Nook fans. The average hold time for the Top 100 was one minute, 41 seconds. No consumer tech retailer made the Top 10 list in hold time. 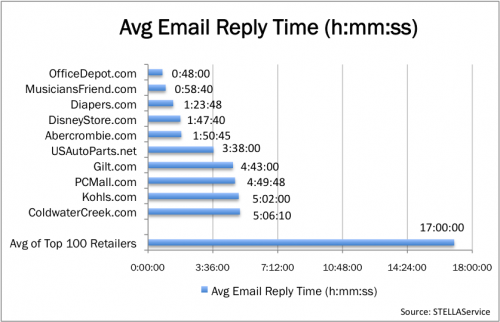 OfficeDepot's average email response time was just 48 minutes, significantly speedier than the 17-hour average for the Top 100. For an extra-slow response, try CrateandBarrel.com, which took nearly four days to respond to email queries. Actually, that may be a good excuse if you're late with gift: Blame it on Crate's sluggish online support. To rate the retailers, StellaService contacted online businesses over multiple days and time periods with 1,200 calls, emails, and "mystery shopping interactions." The firm sent six e-mails to each online store, one during a specific time period in the business day (morning, mid-day, afternoon, and evening). 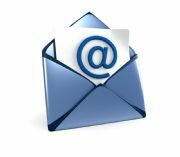 One e-mail was sent on each day, Monday through Saturday. StellaService also placed six phone calls to each online retailer during business hours. It made one call a day, Monday through Thursday, and one on each weekend day. Contact Jeff Bertolucci via Twitter (@jbertolucci ) or at jbertolucci.blogspot.com.